This page is dedicated to your family's favorite Thanksgiving recipes, and mine too. Since Thanksgiving day is focused squarely on food, this is always an interesting topic to discuss with people. 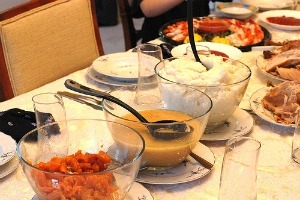 It is always interesting to me how each familiy's traditional Thanksgiving dinner can be so different from one another. For example, when I married my husband I was suprised to find his family always ate mashed potatoes on Thanksgiving day. Well, my family never did. I have no idea why. Now, I can't have Thanksgiving dinner without some tasty, homemade mashed potatoes. On the other hand, my family always had oyster dressing which is something my husband's family squarely turns its nose up at. Well, such is the mixing of two families, right? I read somewhere that there is a sociologist who can predict with a high accuracy rate from what area of the country your ancestor's came from by the composition of your Thanksgiving meal. Pretty cool, huh? Everyone has traditions and favorites, but they are not the same. I'm curious, what are your favorite recipes your family must have every Thanksgiving? Tell me below, especially if it is something unique or unusual. Don't be shy, share those recipes here. You never know, perhaps they will become someone else's favorites too! Pictures aren't required, but they are a great addition, so don't forget to add one if you have it. Your recipe will appear on a Web page exactly the way you enter it here. You can wrap a word in square brackets to make You can use some basic HTML code if you know it, but it isn't necessary.